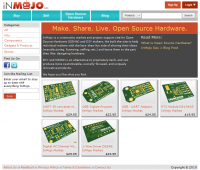 InMojo is a community market and project support site focused on Open Source Hardware that is open to the public. The mission of InMojo is to support and nurture a community of independent makers, buyers and hobbyists by providing a sales channel as well as a social space for discussions, project ideation and development. InMojo is currently in beta version. InMojo team is David Siren Eisner from US, Charith Fernando from Sri Lanka and Jan Rod from Czech Republic. The three guys met during their graduate studies in Tokyo and quickly found out they share passion for open source hardware. Combining interests in software development, electronics design and they realized that there is no place for OSHW community to share designs, so they decided to make InMojo.